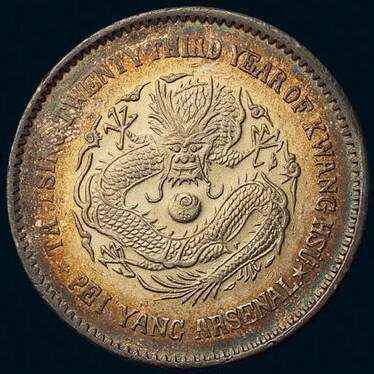 … a beautiful Almond Eyed Dragon from the Peiyang Arsenal mint, one of the rarest variety of an already scarce type. 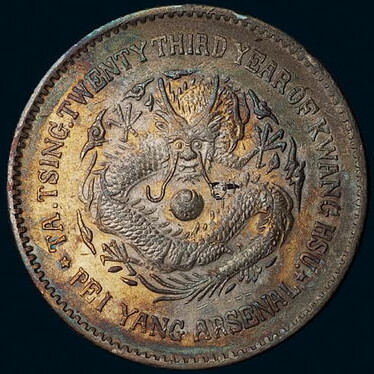 It was obviously handled with great care; the dragon had kept all its scales, his fierce eyes still as piercing as a hundred years ago, when it first went out of the Peiyang Arsenal. 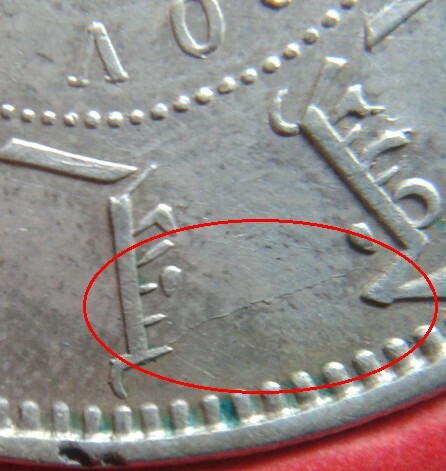 Without the mounting marks at 4 and 8 o’clock, this coin would be worth at least 4,000 Euros! Additionally, the Chinese dragon has a growth on his forehead, the Chĭ Mù (尺木), without which it is unable to ascend to the sky (龙无尺木，无以升天). The “Hidden Cross” and “Hidden Rose” die variations. 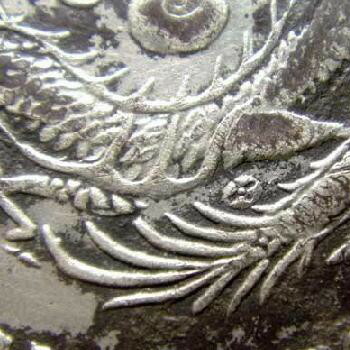 In both varieties, a mysterious mark was added above the tip of the coiled tail. This beautiful die variation can seem superficially very similar to the Evil Eyed Dragon, with only the addition of irides to the previously blind triangle eyes. However, by looking carefully, one can see clearly that this variety is not a mere modification of the original “Evil Eyed Dragon” but a whole revision of the initial pattern. The shape of the clouds surrounding the dragon is different, more intricate. The thigh of the dragon is now shorter. Five dots disposed in a cross pattern were also added to the pearl of wisdom. This type is only second in rarity to the mysterious Hidden Cross and Hidden Rose varieties. 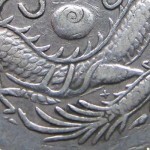 The Beady Eyed Dragon (which is the most common variant of the 1897 Peiyang dollar) has rounded eyes, contrary to the all the previous dies made that year. Like the Almond Eyed Dragon, it is a complete redesign, with the surrounding clouds and the shape of the eyes being modified. 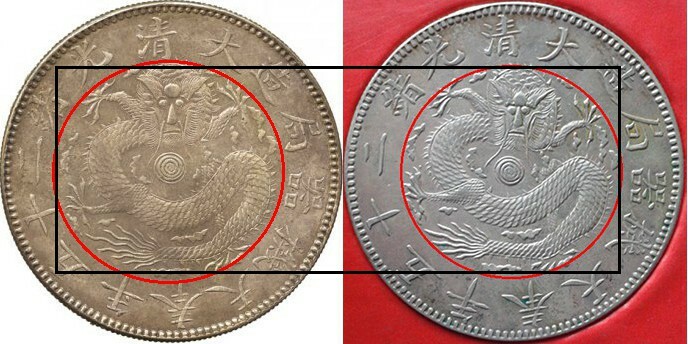 The change from a triangular to a rounded shape will persist in all the subsequent issues of the Peiyang mint. 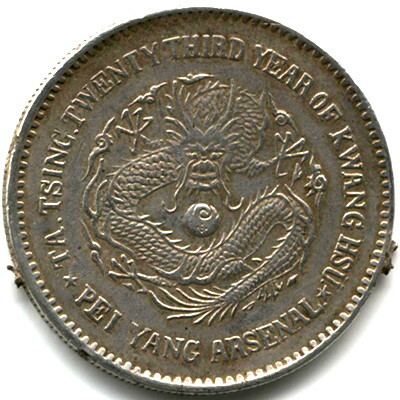 This very rare type is the last one minted in the 23rd year of Kwang Hsü. 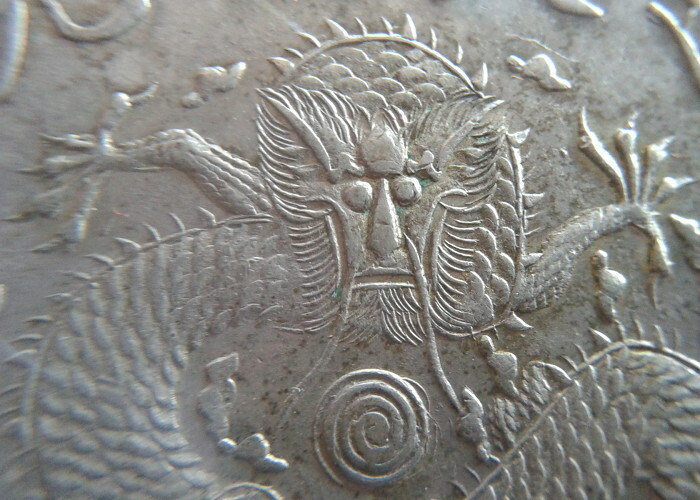 The dragon’s head has been completely redesigned, with short horns and a much bigger Chĭ Mù (尺木) on his forehead. The shape and style of the clouds has also been refined. 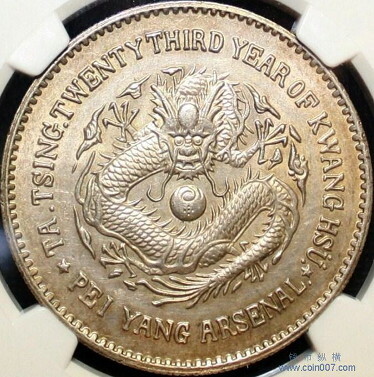 This coin likely served as the prototype for the 24th year of Guāng Xù dollar, which keeps most of the new cloud details and the same Dragon face, although engraved in a crude fashion. The very striking difference in style makes me wonder if the Dog Headed Dragon dies could have been commissioned from another mint, but there is no conclusive evidence to support this theory. 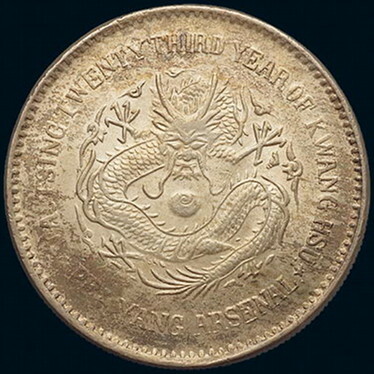 All these dragon dollars are hard to find nowadays, due to the initial unpopularity of these coins: they were the first Chinese coinage denominated in Yuan (圆) and Jiao (角), while the whole country was still using the traditional monetary system based on weight. 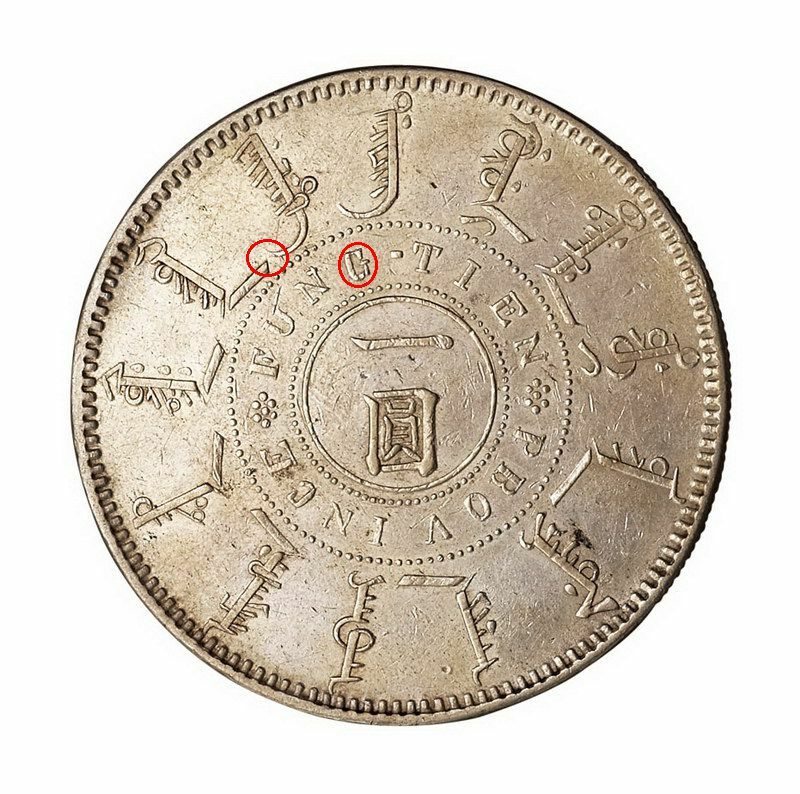 Their rejection caused most of them to be melted in order to mint new coins denominated in Mace and Candareens. Congratulations to our German reader for making such a wonderful Snäppchen!